Offering Intuitive Readings using the Tarot cards and basic Numerology merely as tools to focus on, or whatever inspired messages come through for you without necessarily using any tools. While I am not consciously a medium I do at times receive messages from loved ones now in Spirit, which I will pass on to you as and when they are given. Please note that I am not offering a full Tarot or Numerology reading here. These can be requested only on the appropriate forums. The main purpose of my readings is to better prepare you for whatever the future may hold than with regards to making actual predictions. I believe that I am reading your energy field or aura, and by determining your personality strengths and weaknesses I can offer you helpful insights to greatly increase your chances of achieving whatever you set out to do. To be able to more effectively use the Tarot as an intuitive tool please include only very minimal background information. For example if you want a career reading, what courses have you taken and what type of job have you been looking for? Are you presently unemployed or studying? If you are asking for a relationship or love life reading, are you currently in an existing one at the time you requested the reading? To be able to use numerology I simply need your full date of birth. If you also do not mind posting your first name only on the open forum (optional), this often tends to create a stronger sense of connection when deciding whether I feel that I can be of help to you. How do I request a reading? 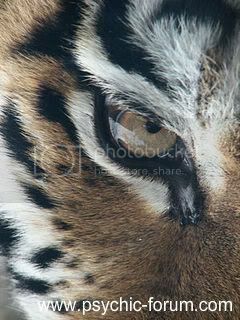 Post your request, here on the psychic reading forum, stating clearly that it is for eye_of_tiger or EOT. Either ask a single question about one life area, OR request a general reading where my inner guidance will decide what is most important for you to know at this time ("general" means I get to choose). If you include your full date of birth with all your requests then this information may or may not be used, according to what I feel are your specific needs. Please include only minimal background information relevant to the type of reading being requested, as explained in more detail above. No lengthy life stories! Like any reading we can not guarantee they can be read within a certain time frame and it is up to the individual reader to assess when it is the right time to reply. We also do not guarantee that all requests and questions will be suitable or be filled. Please also take a moment to read the Guidelines before requesting your reading. Instead of having to individually remind and run the risk of boring all members who are currently or who are in the future planning to request readings on this forum, Thursdays are always my regular weekly day off from giving any readings. This basically means that I will not be looking at your requests again in order to decide if it is felt that I can help you to satisfactorily answer your question through a reading, until at least early Friday morning (Adelaide time). Thank you for your continued patience and tolerance with this humble reader. I wanted to give you an update to my forum profile (October 24th, 2018). I have recently mentioned this before in several postings on the general discussion and psychic reading forums, but up until now I have not updated my reader profile to reflect these changes. While I will still be offering readings on the psychic reading forum, the type of readings which I give will be changing. There will be much more emphasis on giving you what help and advice both myself and Spirit believe you need at this moment in time, and what is felt to be in your best interests to know. Conversely there will be much less emphasis on attempting to predict what your future is most likely to be, whether it is with reference to your job or your relationships (romantic and otherwise) or how likely you are to win a major prize in the national lottery before the end of this year. I am not saying that these things are not important, but I am saying that if you get stuck ONLY concerning yourself with the basic needs of living in a physical body, and having to earn an honest living, you could be missing out on learning valuable lessons about being an eternal spirit temporarily having a human experience (which is what we are all doing). If you would rather not look at your possible higher purposes for living on Earth during such "interesting times" as we are experiencing now, then I would suggest that you try one of the other reading forums instead. This having been said, if during your reading I am given information relevant to your job search, relationships or life in general, then I will definitely let you know about it. In return for this could I please ask a favour of you? Could you please immediately add your date of birth (must be the real one to be of any practical use as part of a reading) and location to your forum profile? For example mine is December 9th, 1952 and I live in Adelaide South Australia. Do not provide any more detailed information about where you live than that (street names, house numbers etc), for reasons of your own privacy and security. I will unless it is obvious that you are not or your user name could mean that you are of either gender, assume for the purposes of your reading that you are female. Please no email addresses, links to other websites, phone numbers or any other personally identifying information should be posted on the open forums. To edit your forum profile, left mouse click on your user name which appears to the right of your private messages link in red print, to reveal the drop down menu. Then choose Profile - Edit Profile - Press the SUBMIT button when you are finished, to save your updated information to the forum database. If you do not click the SUBMIT button, any changes which you make will be lost. Thanking you in advance for doing me this favour.